The use of the suitable packaging is essential to ensure that the shipments are delivered in the best possible way. In this regard, we provide useful recommendations pertaining to the main types of products that are handled in the air cargo industry. In order to achieve an efficient handling of the bulk cargo, new boxes made with corrugated cardboard should be used, as they are the most resistant and able to maintain products according to their nature. This is due to the fact that they are built using a structure formed by a central arched layer (called fluting) nerve of corrugated paper and glued with adhesive on the wave crests. We suggest certified cardboard boxes, which show marks describing the maximum weight of product that these boxes may contain, maximum amount for stacking, etc. All shipments in powdered form must have internal and external packaging (combined packaging). This will allow proper handling and transport of the product. This combined packing should include product's external box and an inner packaging made of polyethylene bags, all of them secured with packing tape. To ensure the staff safety, the contact between the product (powder) and eyes and skin must be avoided, as well as inhalation and consumption of it. Note: If shipments containing solids in powdered form are classified as dangerous goods; please see the packagings specifications in the "Dangerous Goods Regulations Guide"
When the boxes are stacked to form a skid, the number of boxes being stacked must be considered, to prevent that the lower boxes are crushed due to the combined weight. The marks on the outside of the boxes must be verified (when visible) to confirm that only the listed number of boxes are stacked, and/or that they do not exceed the maximum weight limit of internal content that it can withstand when stacked (tare). Pallets must contain strapping (metal or plastic) and corner protectors so that the skid will not come apart when it is being handled. Customers should consider the type of strap suitable for the cargo packaging, ensuring that the cargo is not damaged. During rainy season, it is recommended to plastic wrap all shipments that may be affected by water or that may be damaged when wet. Note: The packaging of live animals should never be covered with plastic wrap as this will block their ventilation and air supply. For perishable Cargo, we suggest the use of waxed corrugated cardboard boxes, in order to protect the packaging and product's integrity against water condensation due to temperature changes (movements in and out of cold storage). For the shipments of fresh fish and seafood, we recommend to take into consideration that is crucial to have a packaging that allows protection and maintains the freshness of your product during transportation. For the packaging it’s imperative to use polyethylene bags with the following characteristics with one of the following types of boxes that we list below. Polyethylene bags: Product must be enclosed in two polyethylene bags of sufficient thickness to retain liquids and resist tears for the sharp edges of the product (fins, bones, claws, etc). The internal and external bag must have a minimum thickness of 40 microns (0.040 mm) and the customer must seal the internal bag with heat sealers, clips or close with elastic bands to prevent any leaks of liquids, except when transporting live seafood. Waterproof Boxes / Wet lock boxes: All boxes must be multi-walled, as well as waxed and waterproof on the inside and the outside. It must have a stackable loading capacity of at least 228.8 kilograms (503 pounds), reinforced corners at the top and bottom, and a top that extends fully over the bottom. If you offer bulk shipments, please note that we do not accept any Styrofoam material for the outer packaging; the outer packaging must be made of waxed and waterproof cardboard. Styrofoam boxes /duroport/duparax/tecnoport: These should be used for internal packaging only, and must be covered by an additional polyethylene bag according to fitness previously described. Corrugated cardboard boxes: All corrugated cardboard boxes should be waxed or treated with another impermeable process. Staples used in packaging should not break the internal polyethylene bags. Cardboard must have a stackable loading capacity of at least 228.8 kilograms (503 pounds). Note: All of the boxes should have the maximum weight capacity printed on the outside of the box. All shipments of dangerous goods must comply with the packaging requirements described in the current edition of IATA’s Dangerous Goods Regulations (DGR). We suggest reviewing these details, due to the fact that if the cargo does not fulfill the specifications included in the aforementioned regulation, it will not be accepted for transportation. Packaging must bear the identification labels according to the type of merchandise being transported. Containers should be in accordance to the actual size of the animal. The container must have proper ventilation to ensure the well-being of the animal being transported and it must have the appropriate identification labels. For more information refer to the IATA's current of Live Animal Regulations (LAR). Corrugated and waterproofed with appropriate ventilation should be used. If the boxes have metal or plastic strapping, it’s imperative to make sure that are not damaged during the strapping process and that these do not harm the animals that you wish to transport. For more information, refer to the IATA's current edition of Live Animal Regulations (LAR). We recommend that the shipment should not exceed a maximum of 50 boxes containing 100 chicks each, due to the high rate of heat output that these animals have within the warehouse space limit of our aircrafts. If the shipment exceeds this quantity limit, the airline should not bear any responsibility over this cargo. All of the boxes should have the proper labels for shipments before delivered to the airline. Shipment of horses or cattle must be comprised of a container without any sharp edges that may injure the animal; the door must be made in a way that prevents the possibility of an accidental opening. The container should be clean and without any filtration. If the container is to be used again, it must be cleaned and then disinfected or sterilized. The customer is responsible for providing a bed of absorbent material to put on the floor of the container. Straw is not acceptable as absorbent material as its import is prohibited in many countries. If the containers are made of wood, they must be made with certified wood that is also strong enough to keep the animal inside. Please take into consideration that the manufacturing of the container must comply with the provisions within the current edition of IATA's Live Animal Regulations. 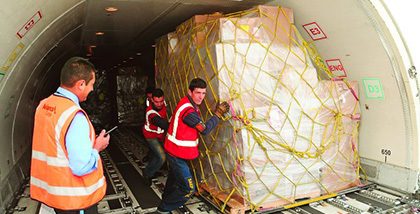 The shiper must verify that the type of packaging allows a safe handling of the shipment in passenger aircrafts. The type of packaging will vary depending on whether or not the human remains are cremated. Cremated Human Remains: should be packed properly in sealed funeral urns; The urn box should be protected with an outer packaging to prevent damage during transportation. Zeigler Unit (Ziegler Tray): the remains must be placed inside a hermetically sealed box and reinforced with outer packaging of pressed cardboard or wood to provide more protection. Coffins: Must be reinforced with an outer packaging using a pressed cardboard box or wood.